Thinking about college basketball already? Yeah, us too. Brackets for upcoming non-conference tournaments were unveiled by ESPN Events Wednesday. 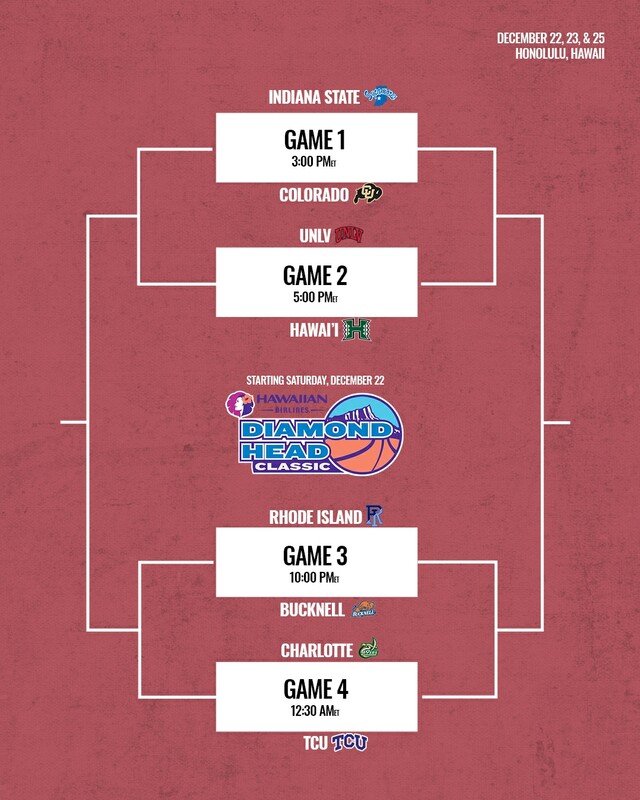 The Advocare Invitational, Charleston Classic, Myrtle Beach Invitational, Wooden Legacy in Orange County, Calif., and Diamond Head Classic in Honolulu are five brackets that fans can check out already. Last season's national champion Villanova will be pushed in a balanced and potentially NCAA tournament-rich Advocare Invitational in Orlando with Oklahoma State and Memphis on its side of the bracket. Villanova will open on Nov. 22 with Canisius. Playing either Oklahoma State or Memphis on Nov. 23 will give the Wildcats another quality non-conference game against a team that expects to be in the NCAA tournament in 2019 after missing the field in 2018. 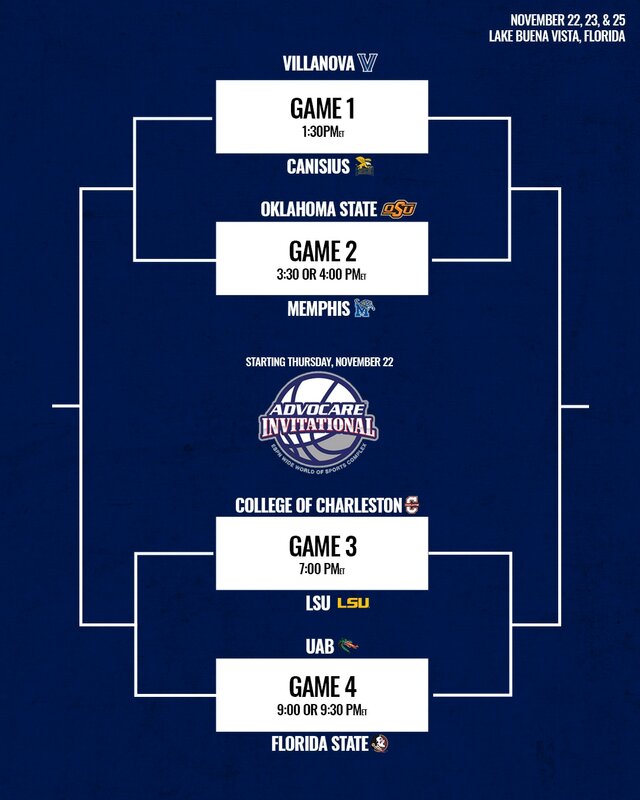 Charleston will play LSU while UAB plays Florida State in the other side of the bracket. LSU has Tremont Waters back next season, one of our NCAA.com top returning players. The Tigers should be one of the more improved teams in the SEC while the Seminoles are coming off an Elite Eight appearance. The third games of this event will be played on Nov. 25 after a day off following the second set of games. The most competitive field may end up being the Charleston Classic Nov. 15, 16 and 18. 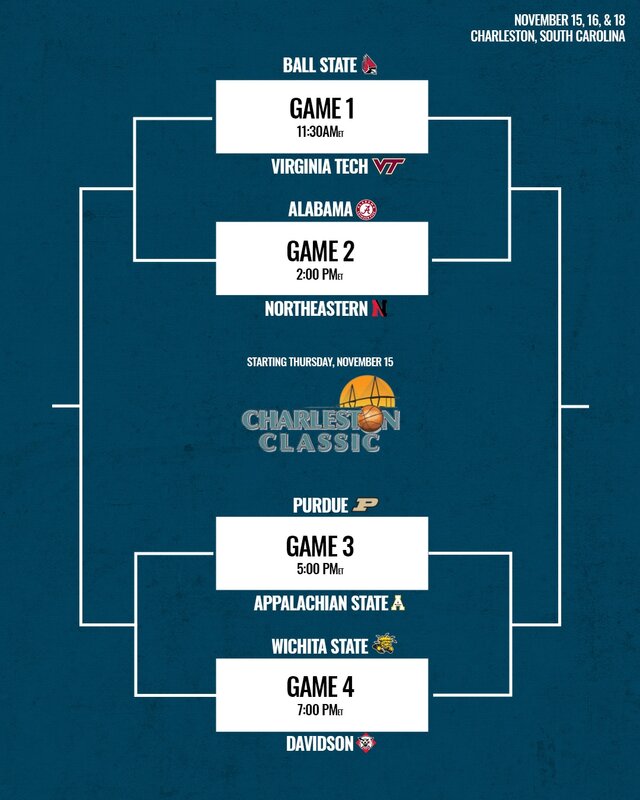 The top half of the bracket includes Virginia Tech hosting Ball State while Alabama plays Northeastern. The Hokies are expected to challenge for a top four finish in the ACC while the Collin Sexton-less Tide should still be in the hunt for a berth out of the SEC. The bottom half of the bracket includes our top returning player in Carsen Edwards of Purdue playing Appalachian State and Kellan Grady, one of the top 20 returning players on our list, and Davidson playing Wichita State. The Shockers are retooling a bit but don't think for a second Gregg Marshall won't have Wichita State amped to be a factor again in the AAC. A potential Edwards-Grady matchup would be must-see watching in the semifinals while a Virginia Tech-Alabama semifinal would end up being a high-level, fast-paced, intense game. This field could have half its field end up in the NCAA tournament. 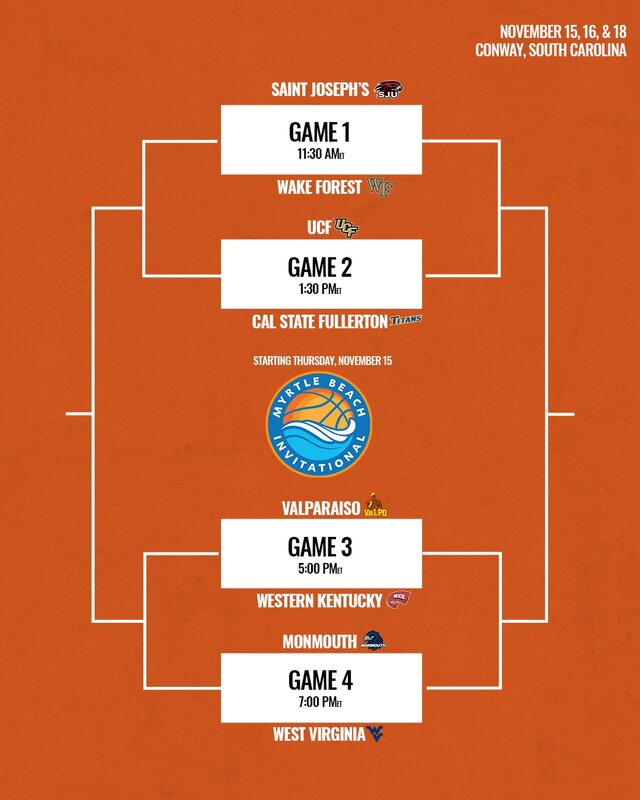 The Myrtle Beach Invitational, slated for the same dates as the Charleston Classic Nov. 15, 16 and 18, has some sneaky good games like Valparaiso-Western Kentucky. West Virginia plays Monmouth in that same bracket. A West Virginia-Western Kentucky semifinal would be quite a matchup with plenty of intensity from both sides,. The other side of the bracket has one of the hidden gems in the country in UCF. The Knights were crushed by injuries last season to BJ Taylor and Tacko Fall. If healthy, then UCF should be the team to beat in the American, although Cincinnati will still likely be picked to win the league. UCF will play Fullerton while Saint Joseph's takes on Wake Forest. If UCF gets out of the first round, then the Knights are likely locked in to getting three quality games -- a must for a program that will need a quality profile for possible at-large consideration. If, a big if, but if the final were UCF-West Virginia then the fans in Myrtle Beach would get a treat of seeing UCF's 7-6 Fall against one of the most ferocious shot blockers in the country in the Mountaineers' Sagaba Konate. The Wooden Legacy (Nov. 22, 23 and 25) will be a critical spring board to see where some teams stand early in the season after losing key players from last season like Miami (which will play La Salle), Northwestern (which plays Fresno State) and on the other side of the bracket with Seton Hall (vs. Grand Canyon) and Utah (vs. Hawaii). Semifinals of Miami-Northwestern and Seton Hall-Utah would be the ideal foursome but this event could easily see upsets as it has in previous seasons. The Diamond Head Classic prior to and on Christmas (Dec. 22, 23 and 25) will come on the eve of conference play and could be the necessary jump Colorado and TCU will need going into the Pac-12 and Big 12, respectively. The Buffaloes, led by one of our top returning players in McKinley Wright IV, play Indiana State while UNLV plays host Hawaii on one side of the bracket. The Buffaloes should and may need to get to the final out of this side for much-needed wins prior to the Pac-12. The other side could set up with a possible URI-TCU semifinal if the Rams can get past Bucknell (no easy feat at all) and the Horned Frogs beat Charlotte. A point guard matchup of Wright IV vs. Jaylen Fisher of TCU would be a Christmas Day treat. The five highest profile remaining non-conference tournaments still to be bracketed are the Maui Invitational, the Battle 4 Atlantis, the NIT Season Tip-Off, the Hall of Fame Classic in Kansas City and the Las Vegas Invitational.